A rainbow over the table and the smell of heaven in the air: this is how most Iranian tables look like when the time of eating comes. Food is a major part of Persian culture, however, it is far less known over the world than it deserves. So what exactly Persian food is? Iranian cuisine is among the finest in the world. It is both sophisticated and simple. Travelers sometimes think Iranian food is hot like the neighboring countries, but it's not the case. Yet, flavors are incredible thanks to a subtle balance between sweet and sour, and the use of fresh herbs and spices. The gastronomy is rich and diverse with countless local dishes, from meat to vegetables, fishes, street foods, pickles, breads and sweets. Persian cooking requires lots of time to be done properly, as many of the iconic dishes is manly stews. 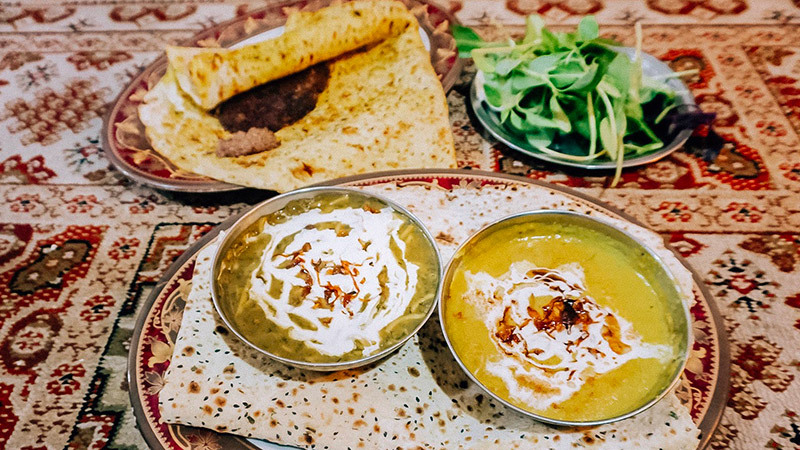 The best place to discover it is without a doubt by sharing a meal in an Iranian house, as the secrets of all these delicious recipes are transmitted over generations as a precious legacy. What makes it so unique is the use of many local ingredients, which give its characteristic taste: pomegranate, saffron, turmeric, rose water, cardamom, pistachio, walnuts, mint, orange, etc. In Persian language, the equivalent of "Bon appetit" is "Nooshe Jan", and it actually says a lot about what Iranian cuisine is: It rather means "may it nourish your soul". Thus, inherited from ancient traditions, the art of cooking in Iran follows the rules of hot and cold natures in ingredients. Not only it ensures good taste but it also keeps an eye on the benefits for the body. Based on the teaching of Avicenna, all ingredients have either a cold or a hot nature. It doesn't refer to the temperature of the food itself, but to its properties and the way it raises or lowers the metabolism. The idea is to keep a balance, by associating cold ingredients with hot ones, such as eggplants (cold) with walnuts (hot), or by consuming more hot nature ailments to answer a cold nature health issue. The benefits of such associations have been proven and, moreover, have been spread to all dishes of Iranian cuisine. 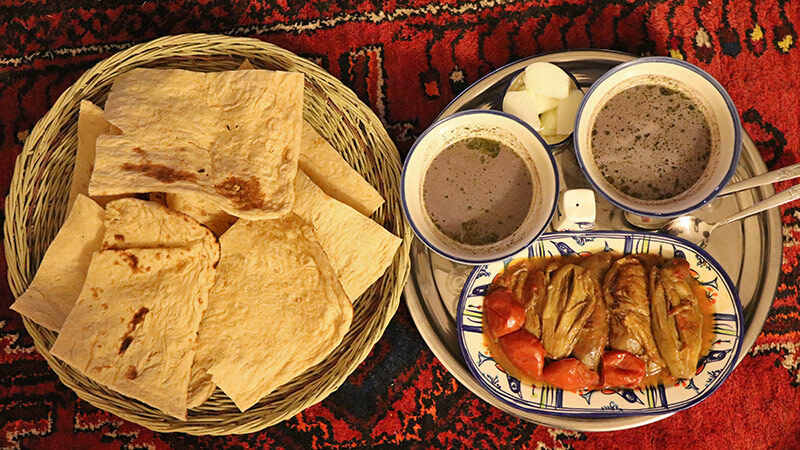 It's no surprise then that food in Iran is way more than kebabs. These latter are various kinds of barbecue meat (from chicken to lamb, sheep, etc.) which are frequent on the restaurants' menus. 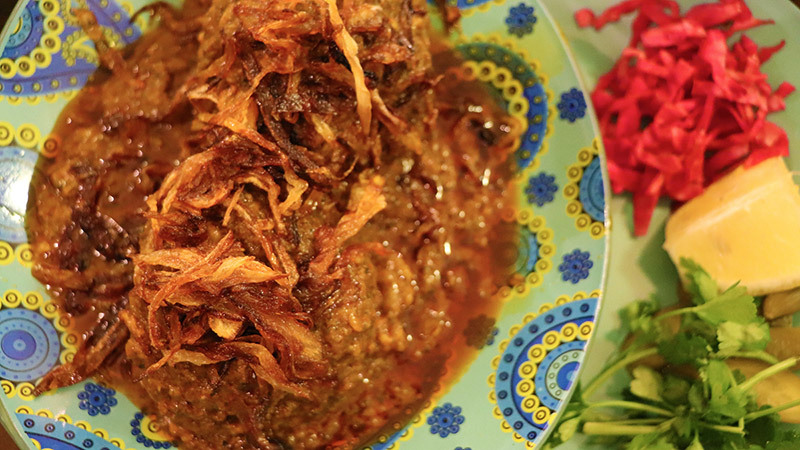 However, the most iconic Iranian dishes differs a lot: Fesen joon (pomegranate walnut stew), Ghormeh Sabzi (green herb stew), Zereshk polo (a type of rice with saffron and barberry), Dizi (a stew made of sheep meat, beans, potato, and tomato), and Ash-e Reshteh (a kind of noodle soup contains of peas and beans) are some of the most famous. 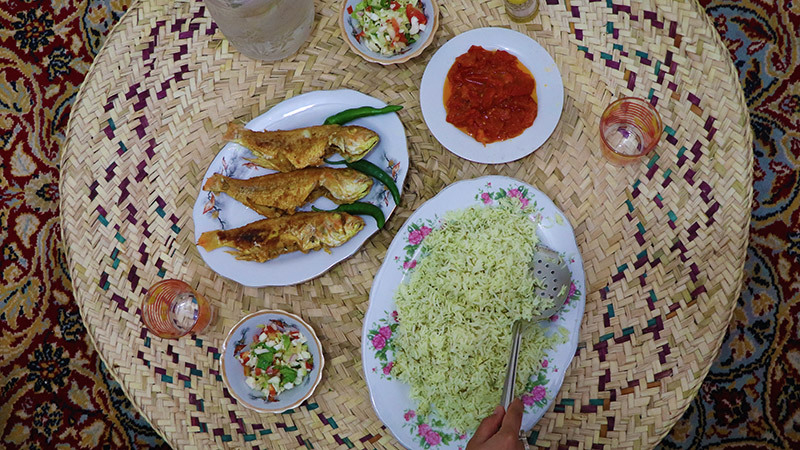 Near the Caspian Sea and the Persian Gulf, many local dishes are based on fresh fishes and seafood. Rice ("berenj") is the core in Persian cuisine, and most dishes are served with large portions of it. 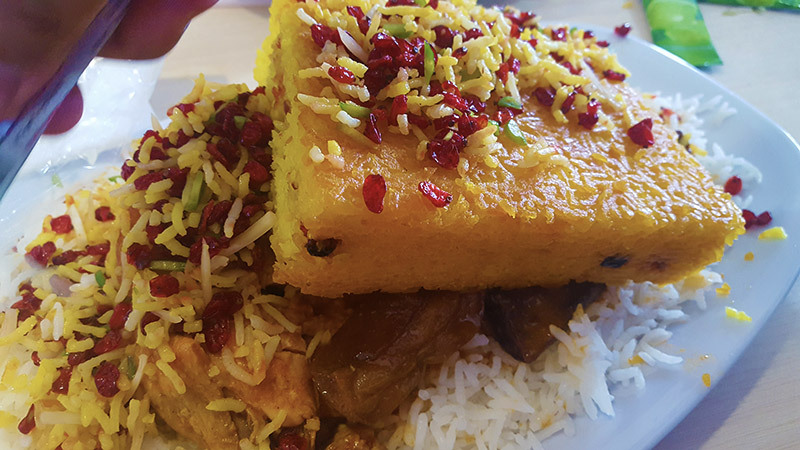 But once again, it's not simple rice: from "chelo" to "polo", and "tahdig" (crunchy fried rice, potato and different types of traditional breads), it often requires lots of time to obtain the perfectly cooked Iranian rice. 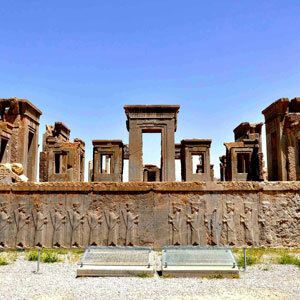 Over history, Iran has developed a strong food identity, getting inspiration from the influences of the Silk Road and neighboring countries such as Russia or Turkey. 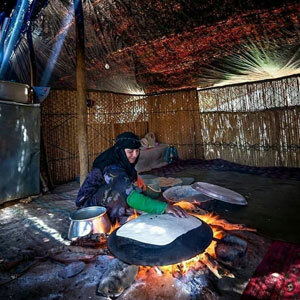 Thanks to its four season climatic situation, and the ingenuity of the ancient underground water system of Qanat, Iran has been able to cultivate different types of food all over the country. It has given birth to a large variety of local dishes: each province and each folk tribe has its specific cookery methods and, as a result, there are plenty of different colorful dishes all over the country. The most renowned come from the northern province of Gilan. Rasht, as the capital city of Gilan Province, is considered by Unesco as a member of the "Creative Cities Network" for its rich gastronomy. 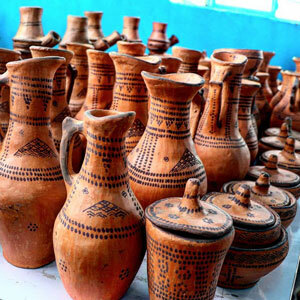 Gilaki cuisine has not only a large variety of tasty recipes made with local and seasonal products, but it also has ancient cooking methods and utensils, which makes it a cultural heritage. There are more than 170 dishes coming from this region, lots of which are vegetarians. 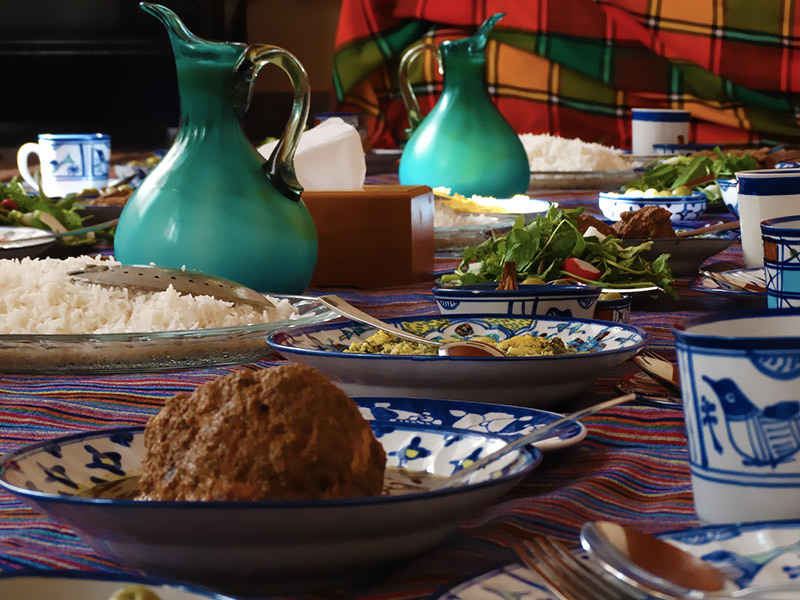 The most well-known cuisines are Mirza Ghassemi (eggplants with eggs, tomatoes, and turmeric), Baghali Ghatough (fava beans stew), Torsheh Tareh(sour herb stew), Sour Kebab, Sour chicken, Houlabe( Walnut, chicken and eggplant stew). 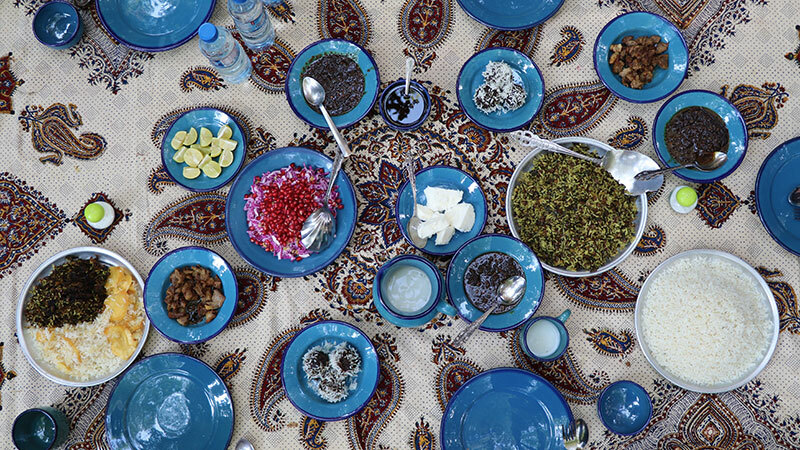 Sharing food is a central part of Iranian culture, and many dishes are cooked for specific occasions and celebrations such as the New Year (Nowruz). 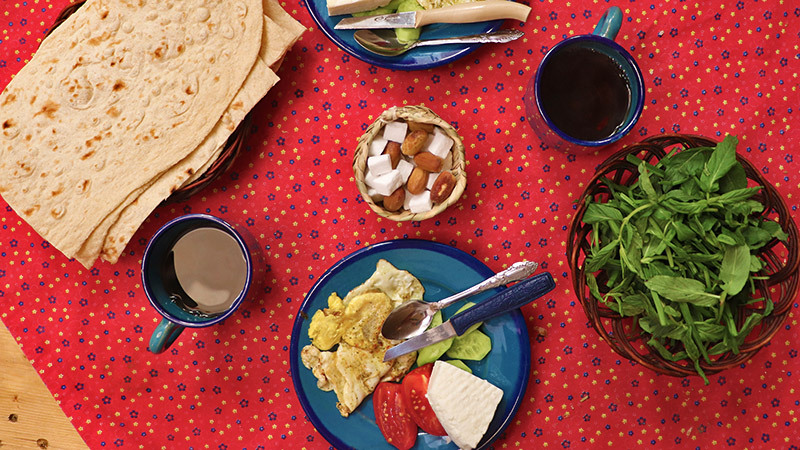 Iranians deeply appreciate having meals altogether and they have turned the picnic into an art. During weekends, you can witness many families settling in parks and nature to grill kebab, drink tea, and simply share a pleasant meal. At home, many people nowadays sit around the table, but the traditional way of sitting on the floor, around the "sofreh" (a table cloth), is still quite common. Lots of traditional restaurants also have "takth", a kind of wide bench covered by a carpet, upon which you can sit cross-legged to have your meal. 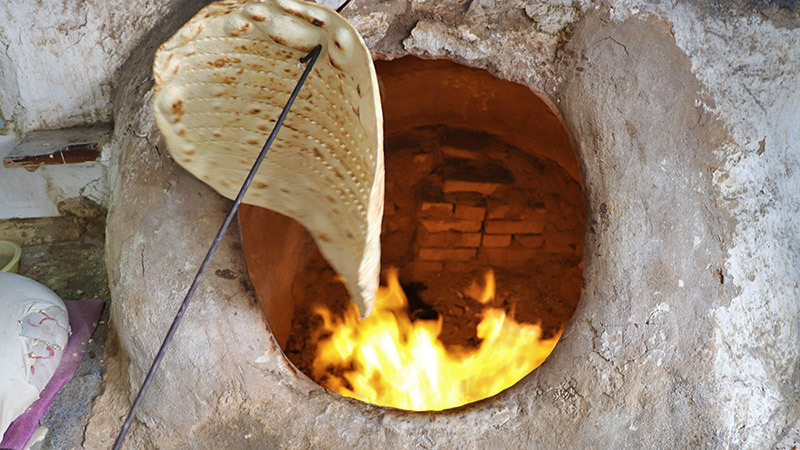 Different varieties of bread ("nan/noon "(as informal Farsi) go with the meals, from Sangak (a flatbread cooked in a traditional oven upon small stones) to Barbari (one of the thickest flat breads) and Lavash (a thin bread made with whole meal flour) and Taftoon (similar to Lavash with bigger holes over it). Meals are often served with appetizers such as yogurt ("mast"), olives ("zeitoun") and Shirazi salad (made with cucumber, tomato, onion, lemon) or a variety of pickles one could never see elsewhere. Herbs, sour orange, and raw onions are also frequently served with different dishes. As it is impossible to enumerate all the Iranian dishes, there also exist numerous sweets ("shirini"): Shol-e zard (saffron rice pudding), multiple kinds of halva (flour fried with saffron, rose water and sugar), baghlava (a pastry made with layers of filo, nuts, and honey), saffron ice cream, and faloudeh dessert (frozen rice noodles ice cream with rose water) are among the most delicious. The traditional drink which accompanies the meal is called "Doogh" and is made of yogurt, water, salt, and different herbs (often mint). 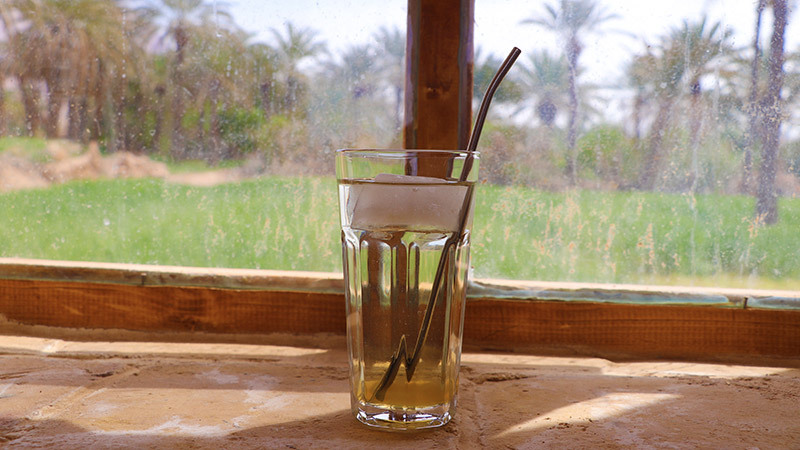 During the day, along with the tasty Iranian tea which is cultivated in the north of Iran, cafes and restaurants serve many types of "sharbat": a fresh drink which consists of different mixes of herbal flavors, herbs' distillates with dry fruits and seeds. 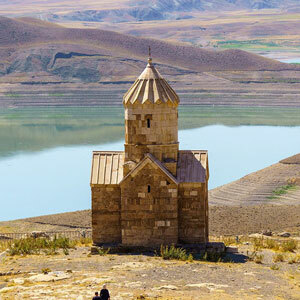 From main dishes to appetizers and drinks, a travel to Iran is also a journey through new delicate flavors. It’s a discovery of the rich and ancient cooking tradition of the country, which has countless ways to surprise you. If you like to embrace the taste of Iranian culinary, join the food tours in Tehran, Isfahan or Shiraz.